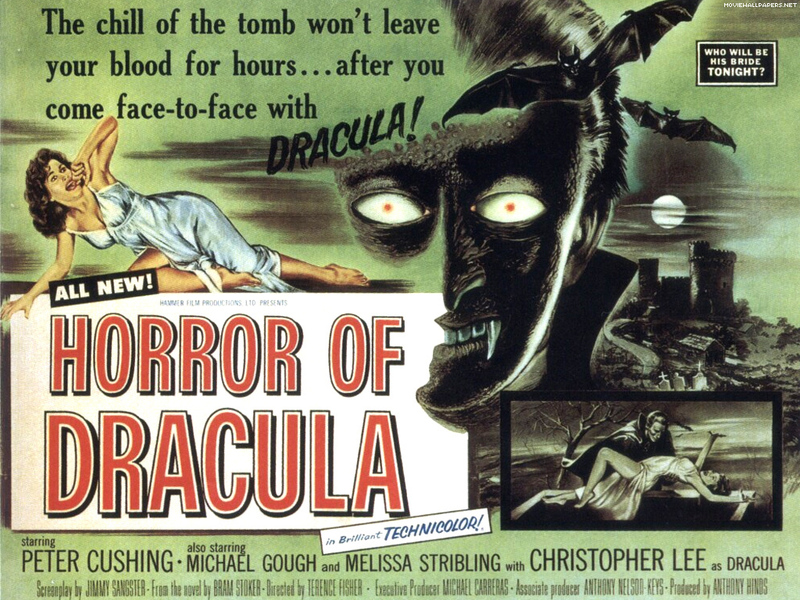 In honour of the recent passing of Christopher Lee on June 7, 2015, this month’s feature is Horror of Dracula (1958), directed by Terence Fisher and staring Christopher Lee, Peter Cushing, Michael Gough, Melissa Stribling, and Carol Marsh. Full disclosure: my previous exposure to Dracula movies is limited to Bram Stoker’s Dracula (1992) and recently watching the 1931 version (“A Virgin’s View on ‘Dracula’ ,” May 26, 2015). I am also slowly reading my way through Dracula (1897), the Broadview Press edition. Before you proceed, beware major spoiler alerts ahead! 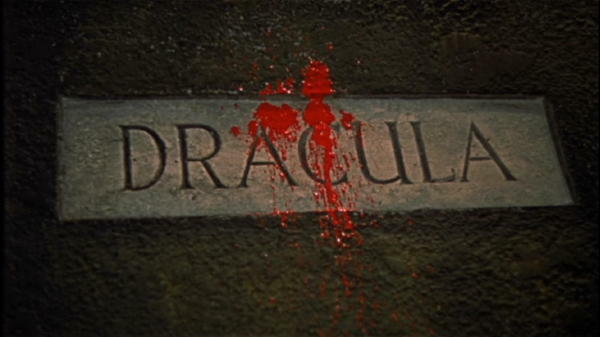 I loved the intro credits because of the intense music that jumped straight in; ending the scene with a shot of a tomb labeled “Dracula” being splashed with some amateurish red paint as makeshift blood. I know back in the day they didn’t have access to the realistic fake blood we do now for films so I’ll have to get over that one. The ambiance was set by a audio pattern; every action scene was introduced and accentuated by the dramatic musical sounds of orchestrational goodness. When the music jumped in, you knew you were in for a treat. The castle itself was newer and more modern than what I was used to in the other films. Part of this could be blamed for limited budgets back in the day. The set looked like it had been assembled from a 1970s garage sale and accented by some candles, drapes and cheesy wall hangings. The ambiance was completely different from the original 1931 film: it didn’t include extravagant cobwebs accompanied by giant spiders, fluttering fake bats dancing around the window fixtures, or automatic creaking doors. What threw me off about this film was where the storyline began as opposed to what I was familiar with. There was a lack of build up and it began with Jonathan Harker (John Van Eyssen) arriving at Castle Dracula. Jonathan was greeted by an empty castle and welcomed by a warm dinner, an open fire and a crazy lady (Valerie Gaunt) dressed like an extra from the set of Gladiator (2000). I assumed Harker was there for a real estate deal like the other movies, but he announced to the lady of the castle, he was hired as the new residential librarian. I was totally confused. 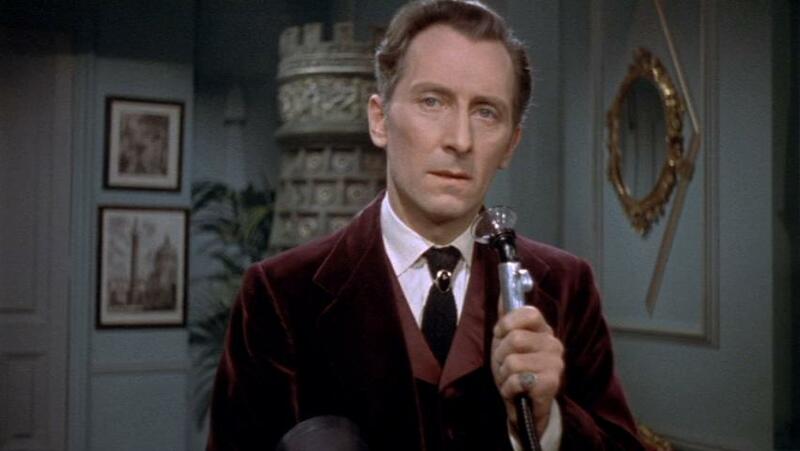 Other tip offs about the altered plot was when Dracula (Christopher Lee) let himself into Harker’s room like he owned the place, and discovered a photograph of Harker’s fiancé, Lucy Holmwood (Carol Marsh). Wait, wasn’t he supposed to marry Mina? It sounds like Harker is working a covert assassination mission from MI6. In true James Bond fashion, he finds the same damsel in distress in the library the next morning and agrees to be her white knight and take her away from the castle until Dracula had something to say about it. Dracula emerged from a secret passage and objects to Harker’s domestic interference and steps up his game with a full minute of vampire chaotic violence. Lee tosses them around like rag dolls until he exits with his lady, but first the femme fatale pays back Harker for his generosity with a bite. Harker passed out on the floor, and demonstrated his vampirological knowledge when he woke up, to find fang marks on his neck and cried. He knew it was game over. Speaking of games, when we met the major player Lee, the first thing I noted was his characteristics were different from his Dracula predecessors. He was stealth, suave, lacked the Transylvanian accent and had that tall, dark and handsome thing going for him. Comparing Lee to Lugosi is like comparing the new and improved T1000 (Robert Patrick) to the first Terminator (Arnold Schwarzenegger) in the second movie, Terminator 2: Judgment Day (1991). 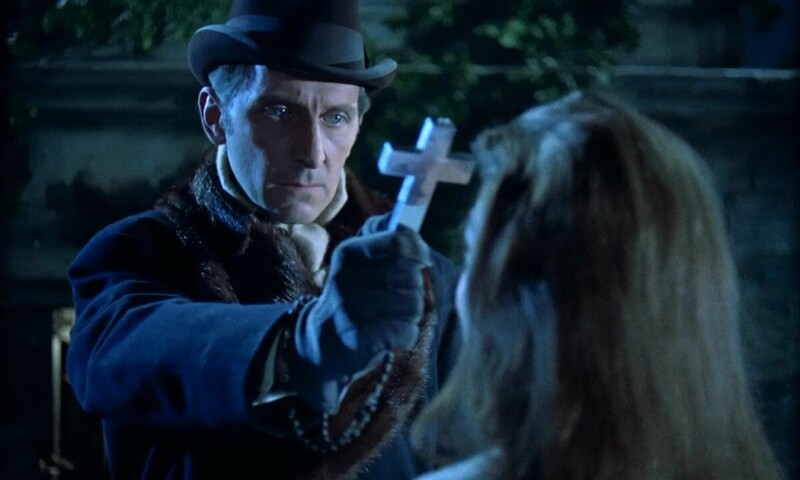 Another altered aspect of the plot was when we finally meet Van Helsing (Peter Cushing) in a local pub, it turns out he’s there to find Harker. That meant he knew Harker was on a vamp killing mission and was now missing in action. Totally opposite of the sheltered Harker we’re all familiar with. The good doctor wasn’t able to get any answers from the pub, but recovered Harker’s journal. He proceeded to Dracula’s castle only to discover his friend vamped out in a coffin and Dracula AWOL. As an audience, we know what has to be done; however, they cut the scene so the staking is left to our imagination. The other plot twist is we finally meet Mina (Melissa Stribling) and Arthur Holmwood (Michael Gough). Mina’s sister, Lucy, was Harker’s fiancé. Again, the characters are mixed up from previous film I watched and book I’m reading. Makes me wonder if they changed the characters around to avoid paying royalties or something? To sum up my thoughts on the soap opera, Dracula goes after Harker’s bride to be, Lucy, out of revenge. An eye for an eye kind of thing. Only the plan doesn’t go very well. Van Helsing knocks off Lucy, liberating her soul and giving her eternal peace. 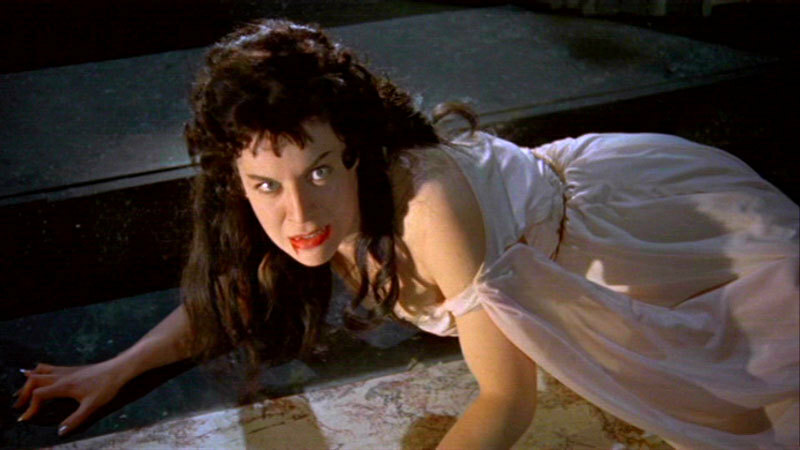 Dracula ends up enslaving Arthur’s wife, Mina, as a substitute. I guess the guy isn’t much of rebound man. All the women Dracula turns are like drug addicts jonesing for their next vampire fix. 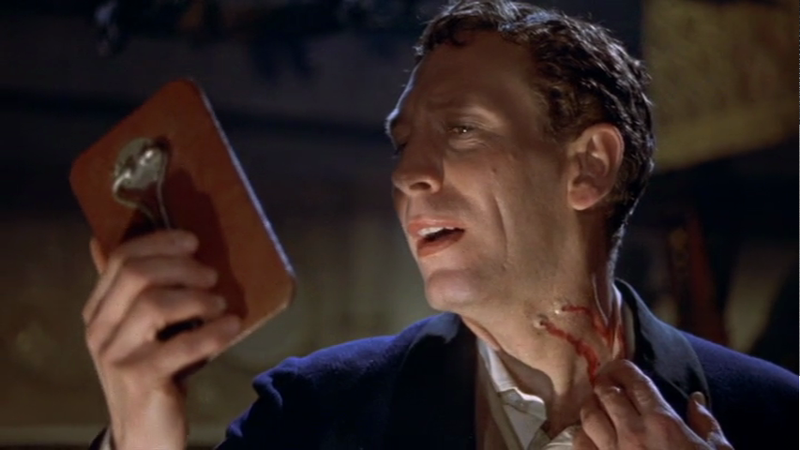 Hell, Van Helsing even compares vampirism to “drug addiction” in one scene. When comparing this film to the 1931 version, one noticeable difference is they stepped up the gore factor; however, only slightly. We see a bloody Dracula bearing fangs in the chaos scene accentuated by blood shot eyes. When Harker ventured into the basement to stake the vampires, both were sleeping with a slight trickle of blood at the corner of their lips. Harker stakes Dracula’s bride first, but we only see the action represented with a shadow. The aftermath is a shrieking corpse that ages instantly into an old woman with a bloody gash and stake in her chest. But the ultimate special effect laced with a hint of gore was in the final scene where Dracula gets destroyed by Van Helsing. The two struggle and Van Helsing steps up his game by tearing down the curtain, letting sweet sunlight flood the room. Dracula’s foot instantly melts like ice-cream and then turns to dust. 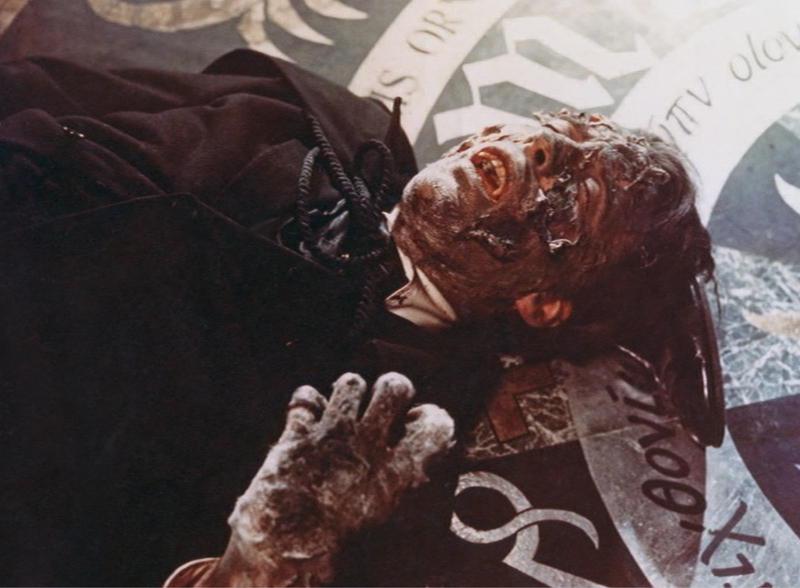 Struggling away from Van Helsing’s makeshift cross, Dracula gets another dose of vitamin D melting off his hand before he loses his face. Thanks to our desensitized horror standards nowadays, this does look pretty fake. But if you think about the time we are dealing with, it was brilliant. Compared to my other Virgin’s Views, this is by far my favorite film. It was easier to take in and the storyline kept me interested because of the curveballs with the plot. By today’s standards this film isn’t scary, but back in the day I bet it was a total novelty. I give this film five stars! You can read Erin’s “Virgin’s View” on Nosferatu (1922) here and Vampyr (1932) here. You can also read why vampires don’t scare her. Interesting how you equate most aspects of this film to other films you’ve seen, most made long after Horror Of Dracula (you pop culture girl, you!). Loved the article, Erin, and glad you liked the film. I like the film, but there is one thing I don’t quite understand in it, and another that makes me cringe a bit. The thing I don’t quite understand is what the Vampire Woman — the one who bites Harker — really thinks of Dracula. That is, I can’t tell how much she really wants freedom from him, and how much she’s putting on an act; an act which might be part of Dracula’s scheme. After all, if she’s sincere in wanting Harker’s help in escaping (and could a vampire need, or benefit from, the protection of a mere mortal?) why does she attack Harker as soon as he agrees to help her? Is it just that she’s thirsty and can’t resist? Her attack on Harker suggests that her pleas for help may have been part of a scheme: a scheme to elicit Harker’s real agenda, i.e. to oppose Dracula. But then it gets confusing, because Dracula seems angry at her in that scene, but we don’t know why. Is it because she bit Harker (too soon, perhaps), or because she desired escape, or both? In short, I can’t tell whether or not she’s in cahoots with her lord, or how much she is. The second thing, which makes me cringe, is that Harker stakes her first, and her scream awakens Dracula. Shouldn’t he have staked the head honcho first, while he had the chance, and dealt with the presumably less strong female captive later (assuming she is a captive)? Granted, that would have ended the movie too soon, but nonetheless Harker’s foolishness in that scene is almost beyond my belief. It would have been better if he’d tried to stake Dracula first and somehow failed, through no fault of his own. Anyway, those are just my thoughts. 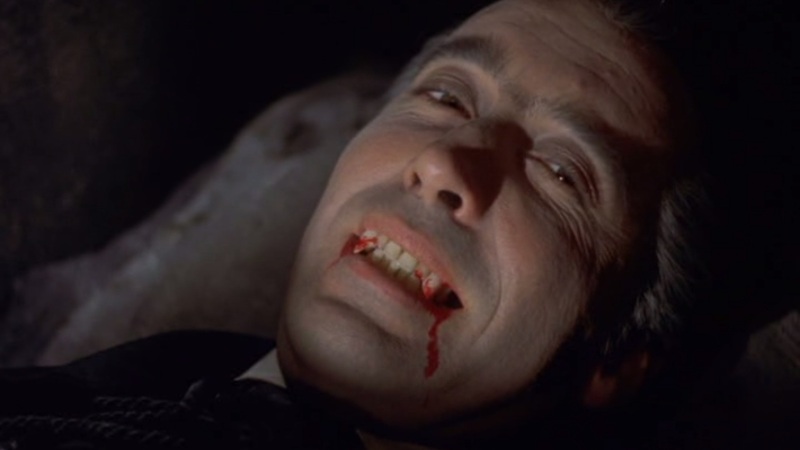 The only other noteworthy point is that when Christopher Lee plays Dracula, he doesn’t wear the traditional “Dracula medallion” around his neck (which seems to have started with Bela Lugosi) although he does wear a signet ring. You could be on to something April, perhaps the entire “damsel in distress” was a ploy. I think Dracula got mad because he had plans for Harker or just doesn’t like to share his food lol. In regards to Harker staking the woman first when he could have taken out Dracula, I think it was a revenge thing. After all the woman bit him, turning him into the creature that he hunted. Yes if they bumped Dracula off in the beginning of the movie, they wouldn’t have much of a plot left. I enjoyed the wardrobe change and like I said the different characteristics of this Dracula. I found it to be more realistic and believable. I have to ask what is your favorite vampire film? My favorite vampire film? The one that comes to mind is a Korean film (at least, I’m pretty sure it’s Korean) called “Thirst,” starring Kang-ho Song. It’s a long movie — over two hours — and for the first 25 minutes or so, it appears to be in the genre of “medical science fiction,” not vampirism. But then the hero — who’s the last person you’d ever expect to become a vampire — gets “turned” in a very original way, and from then on he becomes a truly tragic character, in a story that is as metaphorical as it is vividly real. All the characters are rich and complex, with nobody all good or all bad, and there are so many ways to see and interpret them. There are some flaws in the story (arguably, although that too might be debated), but still, it’s a powerful drama. 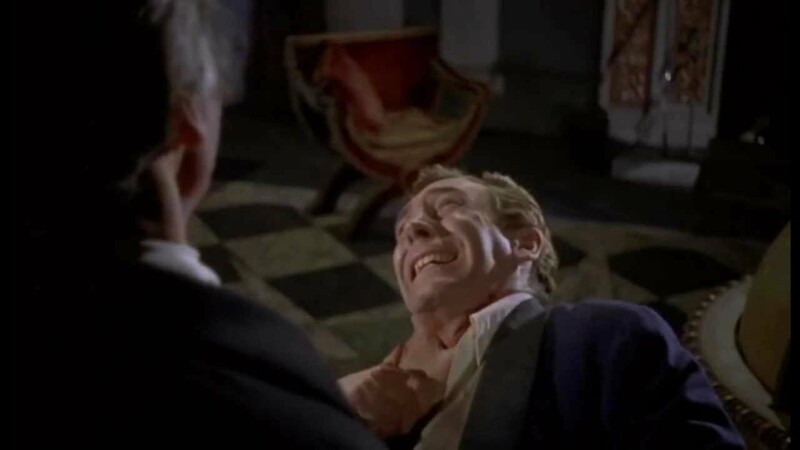 BTW, glad you like my comments on “Horror of Dracula.” I think your point about Harker’s vengeful feelings (toward the vampire-woman) is well taken, although personally I still find that scene at least partly unconvincing, since he’s mainly out to stop Dracula…but maybe I’m overlooking something. I’ll be the first to admit that possibility! Your guess is as good as mine. Since before I am not allowed to research anything before I watch the film I have no idea lol. I guess I am free to read up on it now. Revenge is the only thing I can come up with. If we analyze it when Harker came all that way to specifically kill Dracula, and he had the chance, why give it up to kill her first. Unless he thought he had more time due to the sun not setting. I just love these types of films. They’re the perfect antidote to a bluesy, overcast, or just boring lazy day. Like you, Erin, I enjoy contrastingand comparing these films and their effects with current ones. One thing, though, I was a teen in the 70’s and 80’s, and I remember being freaked out by some of them. I cannot recall the name right now, but one that scared me was with a woman named Carmilla (that may have been the name of the film, in fact). It was on the afternoon movie when I was about 12, and for some reason it frightened me terribly, lol. It’s always a pleasure to read your work, Erin. I am definitely a fan! Thank you Maureen! I’m glad I have a fan. What was it about the film that freaked you out? Also do you have some favorite ones from when you were a kid? I can understand your original impression of this film. I don’t know if you realize this, but it was Christopher Lee’s impression, as well. As for the way he dressed in the film, it was on his insistence. In the book, Bram Stoker described Dracula as being ” clad in black from head to foot, without a single speck of colour about him anywhere.” Truth be told, Christopher Lee hated doing the “Dracula” movies because they had nothing to do with Bram Stoker’s character. He did this first one, simply because of a contractual obligation. The second movie, “Dracula: Prince of Darkness”, he did out of guilt. He had refused to do anymore movies, and the producer called him, personally and asked him, “Do you want to put all of those people out of work?” He was talking about Mr. Lee’s friends. People who he’d worked closely with, who were like family to him. So he agreed to do the movie. However, being the cantankerous person he could be, he found the lines so ridiculously laughable, that he refused, in the film, to utter one word of his scripted lines. Instead, he played the entire movie without uttering one, single word. Christopher Lee was a great actor, but had his principles. He did the other movies, but only because the ramped up the dialogue to be more intelligent, and he was not willing to put his “family” out of work. 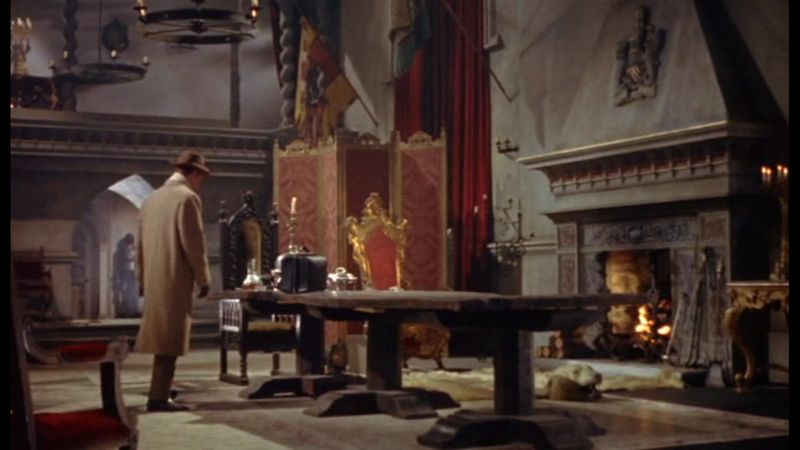 “Horror of Dracula” is absolutely one of the best Dracula films, as well as among the best of Hammer Studios. There have been so many iterations of Dracula on screen. One I think you might find interesting is a 1973 TV Movie production of “Dracula” starring Jack Palance (“Shane,” “City Slickers”) and directed by Dan Curtis (“Dark Shadows,” “Kolchack: The Night Stalker”). It would be interesting to see your Virgin’s View of another Hammer film, The Vampire Lovers (1970). The late Ingrid Pitt was a major player in Hammer’s “Bosoms and Blood” entries. She played not only Carmilla, but Countess Bathory as well. Hi Norman, I definitely have some other Hammer films on my list to watch. When one of my reviews come out I always get a lot of suggestions from readers. The suggestions help a lot! Are there any other films you would suggest besides that?